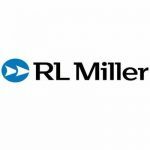 Torque Wrench Pump is available at RL Miller. 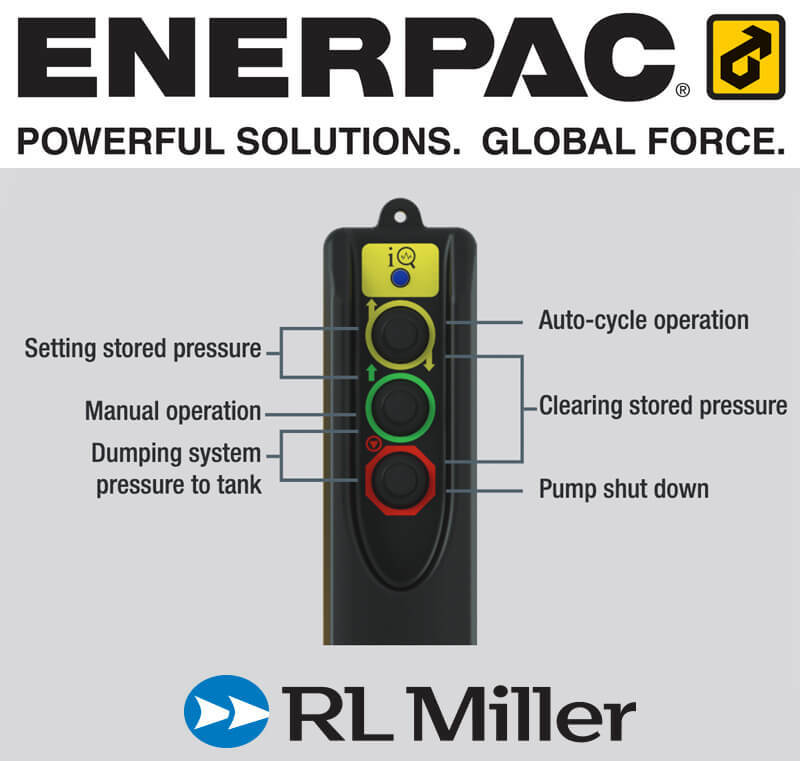 As a leading Enerpac authorized distributor, service, and repair center in Pittsburgh PA. RL Miller is pleased to announce the Enerpac portable battery hydraulic tool.As an elite Enerpac authorized distributor, service, and repair center in Pittsburgh PA. RL Miller is pleased to announce the Enerpac Battery Torque Wrench Pump. 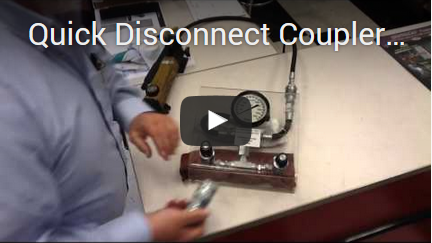 The XC-Series Cordless Torque Wrench Pump. It’s ideal for remote or hard-to-access locations that require the lightweight portability of a battery pump for maintenance bolting conditions, such as Power Generation, and Oil and Gas applications. The 28V 5Ah lithium-ion battery eliminates the need for air hoses, generators, or extension cords and provides excellent run time. With the brushless DC motor, less maintenance is required and motor life is extended – saving your team time and money. Also, the operator can easily set the pressure and operate in manual or auto cycle mode with the interactive pendant. 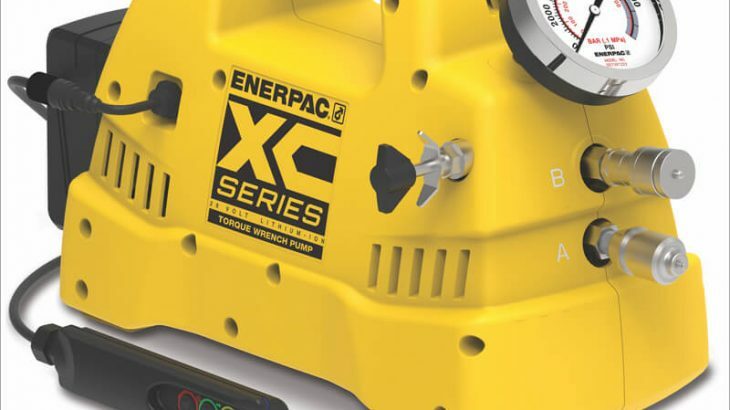 The XC- Series Cordless Enerpac Battery Torque Wrench Pump features an interactive pendant that can be operated in manual or auto-cycle mode. The pendant allows the operator to store a set operating pressure. 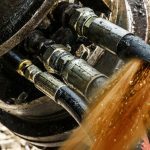 The pump has an easily accessible user adjustable relief valve for precise pressure control along with a bladder reservoir that allows the pump to be used in any position. Additional features of the Enerpac Battery Torque Wrench Pump include a pendant that provides visual feedback, via an LED indicator and vibratory feedback of the pump operations, an integrated handle and carrying strap for portability. The pump also includes a 28-volt battery with lithium-ion technology for maximum battery performance and a quick, one- hour charger. The pump is designed with a high-strength, fiberglass reinforced composite housing to be able to provide superior durability in demanding job site environments. 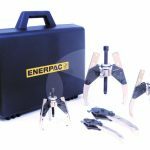 The Enerpac Battery Torque Wrench Pump is designed with a high-strength, fiberglass reinforced composite housing to be able to provide superior durability in demanding job site environments.